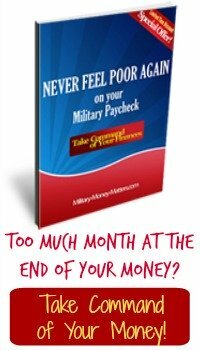 We'll keep you up-to-date with new information added to www.Military-Money-Matters.com. There are two easy ways you can be automatically notified whenever something new is posted. Subscribe to Military Families Blog by Email if you'd prefer to receive our updates via e-mail. We don't post updates every day, so you don't have to worry about daily e-mail clogging your inbox. You'll only get e-mail when we post a new blog entry. Subscribe to our RSS feed. It's easy, it's free, and it's anonymous. No need to give us your e-mail address, or any other personal information. Our new posts will delivered to your RSS reader if you click on the orange "RSS" button in the "box" on the right, and add us to your RSS feeds. If you don't know RSS from Adam, click on "What's an RSS feed?" or just use the link above to subscribe via e-mail. Please feel free to submit information you believe would be of interest to our readers. Blog Archives. Some items may remain at the bottom of the blog page for more than a month -- they're important enough that we want new readers to find them without having to search through archives. Garcia, from P-town, writes: Well, I see the USMC Captain did a fine job for himself, his branch of The Service and his reasons for picking Berkeley. Historic Effort Raises One Million Dollars! I hope you had an opportunity to tune into Move America Forward's history-making web-a-thon today at UStream.tv. It was 8 hours of truly inspiring commentary about our troops and what a great job they're doing, and the gratitude of patriotic Americans for the sacrifices they make on our behalf. The goal for the web-a-thon was to raise $500,000 to send care packages to the troops in Iraq and Afghanistan for the 4th of July holiday. But America wouldn't stop there. By the time the web-a-thon was over, patriots donated more than $1,000,000! We understand that Michelle Malkin is making arrangements to have the entire 8-hour video available on her video site, www.HotAir.com. So if you missed it today, check out HotAir. Awesome job, Melanie Morgan, Michelle Malkin, Debbie Lee, and everyone else involved. You make us all proud. "From the Front Lines" Airs TODAY! Join us TODAY 4 p.m. to midnight (Eastern, 1 p.m. to 9 p.m. Pacific) as talk-radio host Melanie Morgan of Move America Forward and blogger-extraordinaire Michelle Malkin host an 8-hour web-a-thon, including clips from our troops in Iraq and Afghanistan and a star-studded celebrity lineup (see below, or click on the permalink immediately below), being carried live on UStream.tv, and kindly made available to us by them. The broadcast is part of MAF's campaign to send the largest shipment of care packages in history to the troops just in time for the 4th of July holiday, to let them know that while many politicians in Washington put partisanship ahead of their well-being, Americans support them and their mission. We understand the sacrifices they are making to keep us safe, and we want to let them know how much we appreciate them. Join us here for the broadcast, and donate to MAF's care package drive. Before the broadcast even begins, they're already more than half-way to their goal of $500,000 for care package for the troops! Help them exceed that goal! Why would a young man of college age choose the austere, hard-working life at a service academy over the life of a "frat rat" at a party college? Here's one young cadet's answer. . . . We're sure you'll be as impressed as we were. Remember the flap about John McCain's "100 years in Iraq" comment? No doubt you'll hear it again before the election. During the primary season, the same radical left-wing group responsible for the cowardly smear against General Petraeus aired an ad featuring a mother with her infant son on her lap, asking John McCain, "When you talked about 100 years in Iraq, were you counting on Alex? Because if you were, you can't have him." See the response from a Marine Corps wife and mom. Click the link below. Join Move America Forward Chairman Melanie Morgan and conservative blogger Michelle Malkin on Thursday, June 26, as they host a Jerry-Lewis-style 8-hour fund-raising web-a-thon called "From the Front Lines" to support the largest shipment of care packages in history to US troops overseas, just in time for the 4th of July holiday. With the temps well over 100-degrees, those troops will no doubt welcome care packages from home. And with all the anti-war protests, they need to hear from patriotic Americans that they have our support. The goal for this fund-raising drive is $500,000. Before the web-a-thon begins, the total has already exceeded $275,000. The show will air on UStream.tv from 4 p.m. to midnight Eastern time on Thursday. And check out the celebrity participants! Don't you hate those annoying automated answering systems you get when attempting to reach a company's customer service department? It seems like an endless loop, and there aren't any options that say "Let me talk to a real person." Well, we just found a web site that may help solve that problem. The next time you get frustrated by an automated phone system, check out www.gethuman.com. You can either type in the name of the company you want, or browse their list of companies, for instructions on how to bypass that particular company's automated system and get to a real human person (but no guarantee they'll be polite or helpful)! We're definitely bookmarking this one. You probably will, too. June 14 is Flag Day, a day set aside to honor our flag, and reflect on all it has meant throughout our history. There are many patriotic Americans, to whom "Old Glory" is a sacred symbol of all the things that America stands for -- personal liberty, the freedoms enumerated in the Bill of Rights, the opportunity to pursue the life you choose. The Freedom to Serve Act, H.R. 6023, introduced by Rep. Todd Akin (R-Mo. ), would make the recent attacks on military recruiters a federal crime. It's about time! It's easy to complain today about the ingrates in "Hollyweird" who seem to never miss a chance to denigrate our military and the sacrifices these brave men and women have made to give them the right to pursue the frivolous and insignificant (in the grand scheme of things) occupations they have. We're happy to be able to report that not all entertainers are ungrateful for the privileges they enjoy. We noticed some traffic coming from this bulletin board, which is a place for musicians to discuss tech gear, so we went to check it out. We think you'll be pleased to read their postings about D-Day, which acknowledge and appreciate the sacrifices made by service members. D-Day. The Longest Day. These terms are used to describe what has often been called the turning point of World War II, when American and allied forces mounted the largest amphibious assault in history to free Europe from the occupation of Hitler's Third Reich. Roughly 155,000 Allied troops went ashore that day at Normandy, on the northern coast of France. Three thousand of them gave their lives to free the people of Europe from the stranglehold of German occupation. You, as military service members, are admirably and honorably performing your duties. Unfortunately, the same cannot be said about our Congress! Read Blue Star Mom Beverly Perlson's article published today in the National Review Online about Congress' failure to pass the funding bill, which jeopardizes the paychecks of our entire military. Then write your Congressmen/women and tell them to Do Their Jobs! And if you can, head out to support Bev on the corner in front of Nancy Pelosi's office in the Cannon Office Building in Washington, DC. She'll be there through Thursday, urging Congress to do its job. Tell Congress to Do Its Job! Live in or near the DC area? Join Bev Perlson, from the Band of Mothers, on the corner in front of Nancy Pelosi's office at the Cannon Office Building this week, asking Congress to fund our troops. Bev will be on the corner of Independence and New Jersey Avenue from 9 to 5 on Tuesday, Wednesday and Thursday, playing patriotic music and carrying signs reminding Congress to do its job and fund the Defense Department so our service members are not put in the position of serving without pay temporarily. Bev says, "Our Soldiers are really in trouble! Please, if you can make it to the Cannon Office Bldg. corner this week, make it a priority. I know folks have jobs, but even one day can make a difference. God Help Our Soldiers. Please e-mail this information to anyone you know who might be able to join us and encourage them to do so. I have a permit to be on the Cannon Office Bldg corner. Please think about our Soldiers over there. The military is going to have to start cutting back if the funding bill isn't passed soon, and this is terrible for these BRAVE WARRIORS. We all have to help them as they help us every day with their lives on the line! We have got to fight for them like they are fighting for us. Please help me send a huge message of support to our Soldiers and a "disappointing" message to Pelosi, Reid, Durbin, and Murtha." Fund Their Victory in Iraq! We've had the privilege of meeting Bev on that corner. She's an amazing person. The tag line for her web site is "Warriors come from Warriors," and in Bev's case, it's certainly true. Bev's son just recently returned from his 4th tour of duty in Afghanistan. She mans her station on that corner in front of Pelosi's office on a regular basis, despite the fact that she lives in Chicago, and she pays the expenses to be there out of her own pocket. Bev is a fierce warrior in support of our troops. Get out there and stand with her to let Congress know we want our military funded! Hello, my name is Debbie Lee, and my son, Marc Alan Lee, was the first Navy SEAL killed in Operation Iraqi Freedom, so you can imagine that days like today - Memorial Day - are tough days for me. I miss Marc so deeply, yet I am so proud of my Hero, my Mighty Warrior! He loved his country and was so proud to serve in the military and to dutifully undertake the missions he served on - he understood how important it is for America to win the war on terror. As Americans fire up the grill, or head to the lake or the ballpark for this Memorial Day, we ask that you stop and take a moment to remember those members of our armed forces who gave their lives to buy us the freedoms and privileges we enjoy. Take a moment to post your message of thanks to the troops (using the form at the bottom of that page). There's a national Moment of Remembrance scheduled at 3:00 p.m. local time, wherever you are. Major League Baseball will suspend play for one minute. So whatever you're doing at 3:00, please stop and dedicate one minute to remembering and appreciating the sacrifices that have been made to give us lives of freedom and relative peace. Memorial Day is set aside to remember those who have given their lives for the cause of freedom in service to the United States of America. But if you happen to see a (living) veteran today, please take a minute to thank him or her for serving. We, as a nation, can never repay the debt we owe these fine men and women who keep us free. The Greatest Generation, who changed the course of history with its defeat of Nazi Germany in World War II, is dying at the rate of 2,000 veterans a day. We've so little time left to thank them. Sam Bierstock, a Palm Beach eye doctor, felt it important that we let them know how much we appreciate the horrors they endured on our behalf, while we still can. He and John Melnick, a member of Dr. Sam's Managed Care Blues band, have written a song called Before You Go to say thank you to the veterans of World War II and Korea. Click on the link above to listen. We think you'll enjoy the song and the photo montage that accompanies it. A new version has recently been recorded to honor the veterans of Vietnam. You'll also find a link to that version on his website. And here's an awesome Arlington Cemetery Heroes' Tribute. Enjoy your holiday, and the freedom you have because you are fortunate enough to live in these United States. And remember that freedom is never free. Lay Off My Wife -- Is Obama Serious?! In a move that appears to be chivalrous, Barack Obama tells the GOP to "Lay off my wife" when Michelle's comments on the campaign trail come under attack. Does Our Vote Really Matter? The term "Military Mothers" describes two distinct groups of women. On the one hand, it describes mothers whose sons and daughters are members of the military. On the other, it describes mothers who are themselves members of the military. I assure you, both groups are heroes. Please click the link below to read our tribute. You'll meet some remarkable women. In a fitting tribute just in time for Military Spouse Day, a troop-support site operated by military spouses, CinCHouse, wins Webby Award for Best Lifestyle site for 2008. The Webbys have been compared to the Oscars for the Internet. The CinCHouse.com Web site, whose name is military shorthand for "Commander in Chief of the House," beat out such corporate giants as Epicurious and Reebok to take top honors in the 12th annual awards. CinCHouse.com is Operation Homefront's online community for military wives and women in uniform. We can't afford another Republican in office. There should be a 'none of the above' vote to show that all the candidates are sub standard. What happened to Ron Paul? Now he would make a better President than any of the others. Be a part of RED FRIDAY...Show your support for our troops! If you ask a uniformed member of the U.S. military, "What can I do to make things better for you?" one of the most common replies is, "We need your support and prayers." Join a nationwide grassroots effort to show your support of the troops by example: wear something RED every Friday. The FBI will investigate the nationwide recruiting center attacks, after a request to the Department of Justice by attorneys representing the pro-troops organization Move America Forward. are rated 100% disabled by the VA for a service-connected disability sustained after 9/11/01. The applicant must meet Oregon residency requirements. An eligible child must be 23 years of age or younger at the time the child applies for the waiver. Will it be here Jan. 2009? A day after Jeremiah Wright's grandstanding at the National Press Club, Barack Obama says the man he saw yesterday is not the same man he met 20 years ago, and expresses his condemnation of the divisive comments made by Wright. Will the controversy hurt Obama's campaign? As author Amanda Ripley explains in Time, "In most elections, the deceased mother of a candidate in the primaries is not the subject of a magazine profile. But Ann Soetoro was not like most mothers." In pondering the question "Who is Barack Obama?" one must consider the . . . The Department of Veterans Affairs will begin contacting nearly 570,000 recent combat veterans May 1 to ensure they know about VA's medical services and other benefits. "We will reach out and touch every veteran of Operation Enduring Freedom and Operation Iraqi Freedom to let them know we are here for them," said Veterans Affairs Secretary Dr. James B. Peake, a retired lieutenant general who served as Army surgeon general. "VA is committed to getting these veterans the help they need and deserve." Ron Paul. End of story. Unfortunately Americans do not really want change -- they want the same old BS that has been spoon fed to us for years. ScienceDaily reports that repeating mantras can help control the symptoms of post-traumatic stress disorder, have a calming effect in traffic and even ease the boredom of exercise, according to a study in the latest issue of Journal of Advanced Nursing. Eighty-three per cent (83%) of veterans and hospital staff . . . .
"Repeating the mantra seemed to stop post-traumatic stress disorder-type dreams that had occurred for 10 to 11 years" said a former veteran . . . .
Do the fiery words of the Reverend Jeremiah Wright reflect the beliefs of Senator (and Presidential hopeful) Barack Obama? If not, why has Obama not been more outspoken against them? And why would he want Wright's message of hate taught to his young children? Hamas has stated it hopes Obama wins the Presidential election in November. Could this, combined with the support of former President Jimmy Carter, be the beginning of the end for Obama? It certainly should be. Here's an interesting commentary on the movement to keep God out of our schools. This is a new school prayer, allegedly written by a 15-year-old Arizona student, since the Pledge of Allegiance and the Lord's Prayer are no longer politically correct in our schools. We think you'll like it . . .
"Everyday, I live, I breathe, and I think Iraq. It is my life . . . more so than many of the so called experts who rant and rave about it. I walk these streets, I trudge through this darkness that so much of my life has seemed to become. And I am frustrated. It is hard to battle on the behalf of the ungrateful. . . ."
In a voice eloquent beyond his years, Sgt. Eddie Jeffers, US Army, writes about the mission in Iraq, and the good he believes is being accomplished there. He also expresses disappointment in those who criticize our President, our military, and our country, when they don't know what they're talking about because they haven't been there. Sgt. Jeffers was killed in Ramadi on September 19, 2007, at age 23. We pay tribute to him, and the thousands like him, in the only way we can, by keeping his voice alive and spreading his message. We hope you'll spread his message, too, so that Hope never has to ride alone. Please click the permalink below to read Sgt. Jeffers' words. I began my morning with my normal routine of making a pot of coffee and turning on FOX news to see the day's issues. This morning President Bush was addressing this nation and remembering the sacrifices and the successes that this nation has experienced for the past five years since the War on Terror began in Iraq.